For other uses, see Dew (disambiguation). Water vapor will condense into droplets depending on the temperature. The temperature at which droplets form is called the dew point. When surface temperature drops, eventually reaching the dew point, atmospheric water vapor condenses to form small droplets on the surface. This process distinguishes dew from those hydrometeors (meteorological occurrences of water), which form directly in air that has cooled to its dew point (typically around condensation nuclei), such as fog or clouds. The thermodynamic principles of formation, however, are the same. 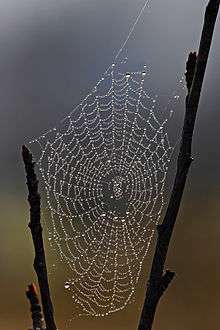 Dew is usually formed at night. A classical device for dew measurement is the drosometer. A small, artificial condenser surface is suspended from an arm attached to a pointer or a pen that records the weight changes of the condenser on a drum. 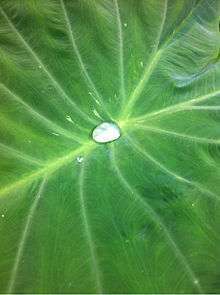 Besides being very wind sensitive, however, this, like all artificial surface devices, only provides a measure of the meteorological potential for dew formation. The actual amount of dew in a specific place is strongly dependent on surface properties. For its measurement, plants, leaves, or whole soil columns are placed on a balance with their surface at the same height and in the same surroundings as would occur naturally, thus providing a small lysimeter. Further methods include estimation by means of comparing the droplets to standardized photographs, or volumetric measurement of the amount of water wiped from the surface. Some of these methods include guttation, while others only measure dewfall and/or distillation. The book De Mundo (composed before 250 BC or between 350 and 200 BC) described; Dew is moisture minute in composition falling from a clear sky; ice is water congealed in a condensed form from a clear sky; hoar-frost is congealed dew, and 'dew-frost' is dew which is half congealed. Several man-made devices such as antique, big stone piles in Ukraine, medieval "dew ponds" in southern England, or volcanic stone covers on the fields of Lanzarote have been thought to be dew-catching devices, but could be shown to work on other principles. At present, the International Organisation for Dew Utilization is working on effective, foil-based condensers for regions where rain or fog cannot cover water needs throughout the year. Large scale dew harvesting systems have been made by Indian Institute of Management Ahmedabad (IIMA) with the participation of the International Organisation for Dew Utilization (OPUR) at coastal semi arid region Kutch. These condensers can harvest more than 200 litres (on average) of dew water per night for about 90 nights in the dew season October–May. The research lab of IIMA has shown that dew can serve as a supplementary source of water in coastal arid areas. A scheme for large scale harvesting of dew has been proposed. The scheme envisages circulating cold sea water in EPDM collectors near the seashore. These condense dew and fog to supply clean drinking water. ↑ "dew". The Columbia Encyclopedia, 6th ed. The Columbia Encyclopedia, 6th ed. Retrieved 18 May 2013. ↑ Hill, Amber. "The Role of Dew in Negev Desert plants". springer. ↑ "Resurrection". Jewish Encyclopedia. Retrieved 21 Dec 2008. ↑ Anil K. Rajvanshi (March 1981). "Large Scale Dew Collection as a Source of Fresh Water Supply". Desalination 36 (3): 299–306. doi:10.1016/S0011-9164(00)88647-6. 10.1.1.6.2585.